Acceptable reduction = 15 degrees of valgus angulation, <10 degrees of anterior or posterior angulation (Koval KJ, JAAOS 1994;2:141). Supine on fracture table. All bony prominences well padded. All bony prominences well padded. 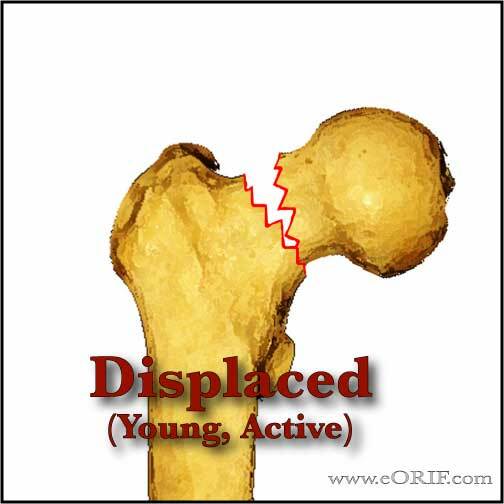 Ensure adequacy of reduction with fluoroscopy before prepping and drapping. Reduction usually obtained with gentle traction and internal rotation. Prep and drape in standard sterile fashion. Usually with shower curtain. If anatomic reduction can be achieved three parallel cannulated screws are placed. See specific manufacture technique to the right for cannulated screw techniques. 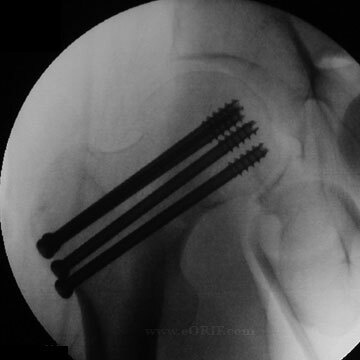 Screws should be placed proximal to the lesser trochanter to avoid post-operative subtrochanteric femur fracture. Staight lateral incision starting just distal to greater trochanter and expended distally. Deep fascia divided in line with skin incision. Interval between tensor fascia and gluteus medius muscles is developed. Anterior capsule is identify by elevating pericapsular fat with a Hohman retractor. Capsule open sharply along the femoral neck. Evacuate hematoma. 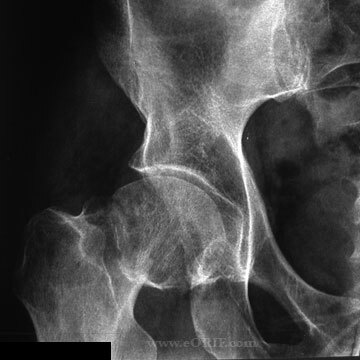 Fracture is reduced anatomically and reduction is varified fluoroscopically. Consider using a Schanz pain in the prosimal lateral femur distal to the site of screw placement is reduction is difficult. Three parallel cannulated screws are placed. There is no benefit in using >3 screws. (Springer ER, CORR 1991;267:85). 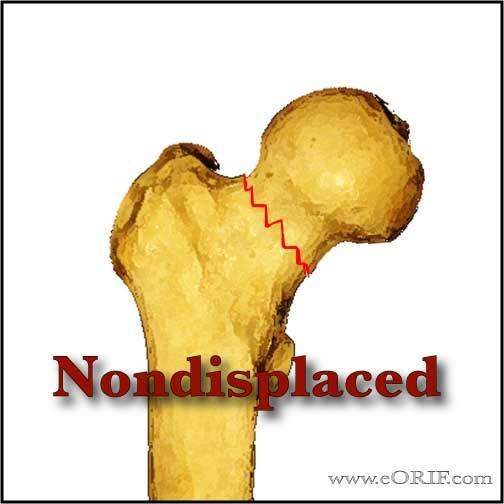 Displaced fracture = nonunion-10-30%, osteonecrosis=15-33% c internal fixation (Koval KJ, JAAOS 1994;2:141). Loss of fixation / fixation failure: increased risk with increased initial displacement, non-anatomic reduction, increased patient age, and posterior femoral-neck comminution. -No study has shown immediate weight bearing to contribute to mechanical failure of the implant, however several studies demonstrate that the muscle forces across the hip joint required to maintain a strict non weight bearing status are greater than those with partial or full weight bearing.